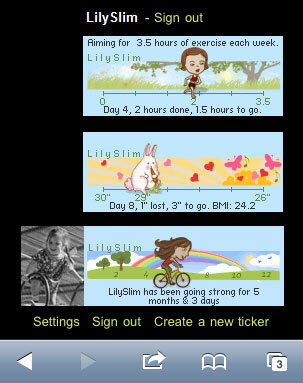 We have added a web App to LilySlim that lets you view your tickers on your iPad, iPhone or iPod. If you have a My LilySlim account you can have your own My Mobile page that lets you view multiple tickers on one Safari screen, change the ticker order, and remove tickers or photos. If you don't have a My LilySlim account, you can still view tickers on your iPod, iPhone or iPad. Notes on adding and viewing your tickers on an iPod, iPhone or iPad.